Here we have a natural gas heater that will not only warm up the air in the room but also provide an all-day-long comfortable temperature in those cold winter days. Mr. Heater’s unit is the perfect choice for large spaces that do not warm well and can be used as a substitute source of heating, too. Mr. Heater’s product is natural gas-operated which means that you will get a safe and convenient device for warming up the air in your room. This is a conventional heater, and therefore, the heat produced from the unit will dissipate quickly upwards, increasing the temperature of the air in your living space. The blue flame is perfect for living room heating, kitchens or any open spaces with proper ventilation. However, it is not a good idea to install them in bedrooms or bathrooms because of safety issues. The unit can be either mounted on your wall or placed on the floor. In both cases, the package includes everything you need – hardware for wall installation as well as legs to position it down in your room. And the most convenient thing is that you do not need any sockets since this is not a heater that uses electricity. So, your mounting options are numerous, just make sure it is near the gas line. The outer body of this heater comes with a ceramic glass in front of the blue flame and a steel cage right in front of the protective glassware. When the unit is on, the ceramic glass gets really hot as well as the metal grate in front of it so it cannot serve as a protection against curious little children. Furthermore, you have to make sure no pre-schoolers are playing around the heater without adult supervision. The control of Mr. Heater’s product is set on top of the unit. You can regulate the temperature via the plastic dial knob which can range from 0 to 6. This way you can adjust the temperature from 60°F to 118.4°F. Nevertheless, you have to manually set the levels of warmth in the room since this heater is not electronically-operated. Hence, when you turn on the unit, it will stay like this until you switch the knob in off position. Another feature that will make using this unit easier is the electronic igniter which comes with batteries in the package. Also, there is an optional blower fan that you can purchase additionally, which can be easily installed at the back of the heater. Since this unit is natural-gas operated it comes with an oxygen detection safety-pilot technology (ODS). In other words, when the oxygen level in the room is low, the chances of sustaining the flame decrease, so the pilot flame is extinguished by the in-built safety function of the heater. This way, you are protected from a dangerous gas leak when the unit is operating without the pilot being on until the oxygen levels in your living space are restored. Also, Mr. Heater’s warming device cannot be used in places which are more than 4500ft above the sea level as the heater will automatically shut down. 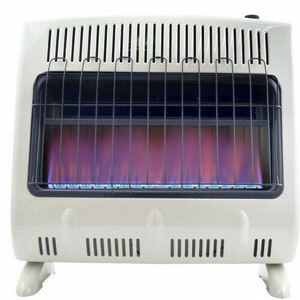 Mr. Heater Blue Flame Natural Gas heater comes with a 1-year limited warranty.